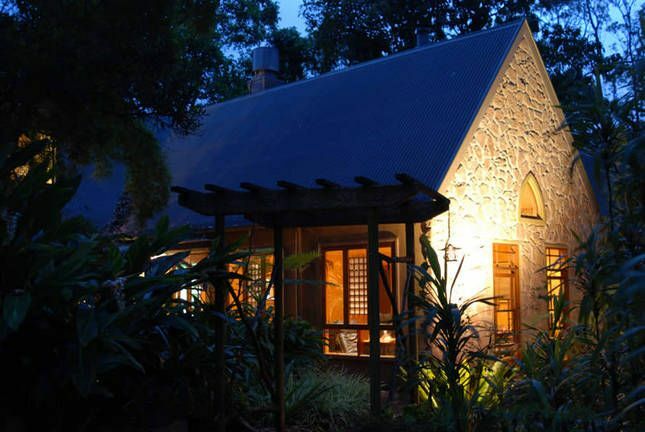 Witches Falls Cottages are tucked away on Tamborine Mountain behind Surfers Paradise in the Gold Coast hinterland, less than an hours drive from Brisbane. These delightfully different cottages provide intimate comfortable accommodation for couples - the ideal location for a romantic getaway, and for those wishing to explore the magnificent National Parks. Our wish is for you to relax, rejuvenate and reconnect as our guests. Nestled among flowering scented gardens and towering Rose Gums, each split level air conditioned cottage has a stone gable, bullnose veranda and features polished timber floors, a cosy fireplace and a double spa with an indoor/outdoor feel with the bathroom opening to a private garden and glass roof to let you watch the stars from the spa! In the separate shower you'll feel at one with nature. Inside the cottage the bedroom is on a mezzanine level separating it from the lounge area. As well as the comfy seating the cottage lounge is fully equipped with everything you need for a perfect getaway, CD player/radio/iPod dock, a DVD player to enjoy a movie from our selection, and a kitchenette to prepare and serve your food to enjoy in front of your log fireplace. For those balmy summer evenings we have given each cottage its own private courtyard garden which has a covered BBQ and dining area, a great spot for dinner, breakfast or just a glass of wine while watching the stars. From your cottage at Witches Falls your nearest neighbour is Witches Falls National park, Queensland’s oldest national park and a magical walk after breakfast. You may be lucky and see an Albert's Lyrebird or a myriad of other wildlife that live in the National Park. It’s not only in the park you'll see the local wildlife, in our grounds you will find the rare and beautiful “Land Mullet” a glossy black skink, bandicoots, possums, blue tongue lizards and birds ranging from King Parrots, lorikeets, bower birds and a host of little ones that live in our gardens. You don’t have to stay in though, from your cottage you can walk to local wineries, antique shops, galleries, the local village and the famous Rotary Lookout is only 150 meters away where you can enjoy a magnificent sunset that Mt Tamborine is well known for. We are more than your usual B&B – one of our specialties is our breakfast hampers delivered to your cottage each morning, delightful breakfast options with free range eggs, bacon, German sausages, tomatoes and mushrooms for you to cook when it suits you or locally smoked hams and cheeses, cereals, fruits and yoghurts - And all of our breakfast hampers come with a loaf of fresh home baked bread each morning – yum! Sumptuous BBQ dinner hampers can be provided on request or you are welcome to bring your own provisions. We want to exceed your expectations. We want you not only to relax, rejuvenate and reconnect but leave feeling you enjoyed the best of Mount Tamborine and Witches Falls Cottages gave you the best value for your money.